These types of walls are generally not full height walls and can be used to create additional height in a roof system or create a separation between rooms. Which choice best explains why parts of the wall have started to break apart? The wall is so big. The wall is a series of smaller walls. The wall is so old. The wall spans across China. 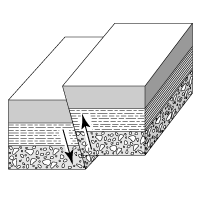 On the fault diagram, the rock to the left of the fault is called the and the rock to the right of the fault is called the . When using a ladder, the vertical distance between the ground and where the ladder touches at the wall is 20'. Where must the base of the ladder be placed in relation to the wall? Anchors can be used for either gympsum wall board, or a concrete wall. THe two types of anchor are hollow wall anchor for a gypsum board wall or a solid wall anchor if it is a concrete wall. What is the largest man made structure on Earth? What is the greatest architectural contribution the Chinese designed? The door jamb width is equal to the finished thickness of the . is the outer layer of a hurricane where there is rain and wind. is the calm part of the hurricane. is a brick wall made to protect cities from hurricanes. contains the hurricane's fastest and most violent winds and rain. Where did the narrator put the person or thing that he killed with the axe? There's a hole in the wall. A settlement that is separated from other settlements by features such as oceans, mountains, etc. An Ancient Chinese wall originally built to protect the Chinese from the Mongols. A 4.000 mile long ancient trade route linking China to the Mediterranean. the stiff outer layer of a plant. the part of the plant cell that produces food. What is the name of the vertical member of a wall system that is supported by a bottom and top plate? Built in 1961, this became a symbol of the Cold War and prevented Germans from escaping from East to Western Europe. What is the imaginary wall through which the audience views the play? Which choice best explains why the wall is actually longer than the border of China? The wall goes into another country. The wall twists and turns. The wall is broken up into many pieces. The wall was built when China was smaller. What is one main difference between a plant and animal cell?